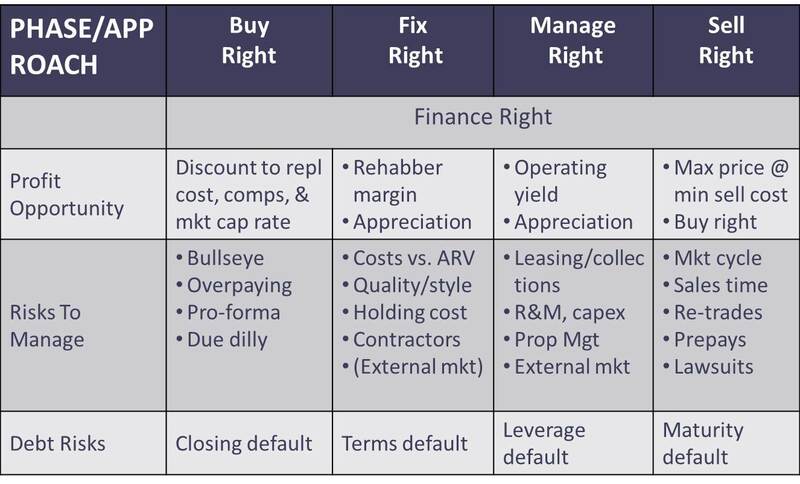 The many approaches to real estate and associated buzzwords can be daunting, so I created a simple framework that shows who is responsible for accomplishing each main value-add phase in a real estate project, for a range of investment options. 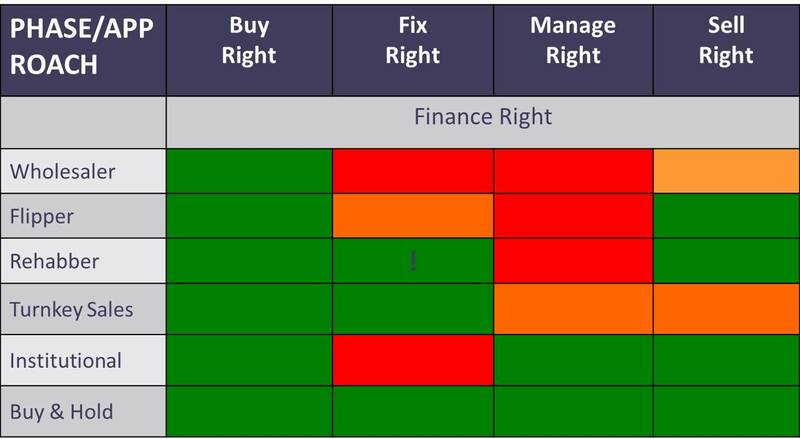 As the top of the chart indicates, nearly every real estate deal involves 4 primary phases: Buy, Fix, Manage, and Sell - with Finance underlying each phase. Whoever performs each phase does some work, takes some risks, and makes a profit for the value they added in that phase. Ultimately, every phase is about risk/reward, and Success = Time + Expertise + Experience + Network + Information Access + Analysis + Capital. The components of this equation are different for each phase of every deal. If you have capital to invest in real estate, assess very carefully how many of the other critical resources you can bring on target at each phase. Classic: Many investors start by doing everything themselves. Using a realtor to find deals is often a very good strategy; however, to get discounted deals you need to beat the crowd and explore options beyond the Multiple Listing Service. If the house next door goes into probate, grab it! Many investors specialize within the Classic approach. The only real difference between a buy and hold investor and a flipper, per the chart, is that the flipper skips the Manage phase. A rehabber is a flipper who focuses on the Fix phase. A wholesaler simply skips both the Fix and Manage steps, and accomplishes the Sell step before the Buy contract closes. You can be any of these specialists or transact with them. Managed: Buying and fixing is cumbersome, but experienced “hold” investors will tell you that rental management is often the greater challenge. You can skip the burden of finding and qualifying tenants, collecting rents, and taking midnight service calls by hiring an ace management company. They can simplify the process of owning real estate, but, of course, finding good managers takes work. Even with a good, trustworthy manager, you still need to stay on top of your business and know what is going on. Management is all about people, and people can change fast. Turnkey: Here you buy a property already renovated and with a qualified tenant on board; usually management is in place at purchase. Essentially, it's cash flow from day one. Buying turnkey properties makes the process easier and less risky, especially if you are entering a new market. The downside is that someone else buys right, fixes right, and profits from those phases before selling the property to you. Syndicated: This enables investors to access larger/commercial deals, diversify across markets/asset classes, and capture profits from value-adding phases they could never perform themselves. An expert syndicator does all the work, and the profits from all 4 phases are shared between the syndicator and investors - typically after the investors receive a minimum preferred return of 7-10%, depending on the asset or deal. An experienced, reputable syndicator may put some of their own funds into a deal. If a syndicator wants a big up-front fee, more than a few percent of the deal, run! Fund: Often used to enable an operator to acquire multiple properties within a market/class, some or all of which are unidentified at the time of fundraising (for example: "we will buy 50 rental fixers in Atlanta”). The profits are similarly shared between the operator and investors based on a prospectus and subscription agreement. For most of us, to invest more than an hour from where we live is to start heading downwards in the chart. Even an expert in one geographic market or asset type will head downwards to invest in a market or asset type we are not “experts” in, but someone we know is. For example, I syndicate boutique deals in sweet spots I know, like Dallas-Fort Worth and now Costa Rica, and I own shares in managed Louisiana condos - yet I am also considering an investment in a single family rental fund. Why? Because I don’t have time for SFR details in yet another market, and the fund operator can do it much better than I can. I find it worth giving him 25% of the profit to get 75% of all 4 phases while avoiding 100% of the work and headaches. What’s your math in the success equation? 1) Outside of some market cycle points in some anomalous markets (like Silicon Valley now), real estate is NOT a liquid investment. You may be in any deal much longer than you plan, or need more reserves than anticipated. 2) Debt leverage is a two-edged sword: it can make you rich faster, but also make you poor faster if you need to sell or refinance at the wrong time. 3) Diversification is vital for risk reduction: if a majority of your net worth is in one asset class/market, consider spreading it among others using this framework. I do. The Bottom Line: Before making a real estate investment of any kind, carefully assess the resources you can bring to bear on each step in the process, and then decide if your risk/reward profile is better served by doing that step yourself, or by leaving it to a focused professional. Understand your strengths and passions, and work from those. Thinking this way can expand your universe of potential real estate options, make you more money with less work or risk, and help you avoid costly mistakes. Arthur Zwern is based in Silicon Valley and Founder of Next Level Assets.